The Library: The first Library segment in the new studio! 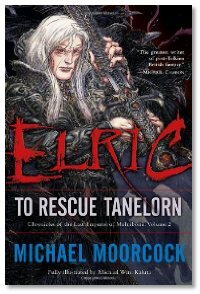 Elric: To Rescue Tanelorn by Michael Moorcock; Pirate Sun by Karl Schroeder; Time Machines Repaired While-U-Wait by K. A. Bedford; Acacia by David Anthony Durham (mmpb release); Vacation by Jeremy C. Shipp; Shadow of the Scorpion by Neal Asher; Lachlei by M. H. Bonham; The Hero of Ages by Brandon Sanderson; The First Patient by Michael Palmer; The Company by K. J. Parker; Jack: Secret Histories by F. Paul Wilson. Your #324B show stops in mid review. Any chance of hearing the missing bit? Do you guys realize that every link under the Dragon Page tab and quite a few of the other links on your site just dump people back into the list of episodes? Draco Vista Studios, Listening to the dragon page podcasts a simple guide, Get in touch with the dragon page, and many others don't take people where they claim. It makes your site confusing. @Tony, can you explain what you mean by mid-review? There isn't a review in this episode. @Abbie: yes, some links were lost during a transition, and we're working on it. Ah-ha. Well, I enjoy your show anyway. 🙂 When I first poked around the site, I thought it must be half-abandoned, but the show always seemed perfectly alive. What Tony was referring to is that midway through Mike Stackpole's review of "The First Patient" at about 17:15 into the podcast. It cuts from Mike's reading of the description mid word and goes into the Farpoint Media closer. The complete file downloaded into my feed, so it's possible there was a server hiccup when your copies were traveling down your subs. Could you guys try deleting that file and regrabbing it? See if the complete version of it downloads for you the second time, and let me know? Sorry Summer. Just deleted and downloaded it again and at the exact same point it cuts out of Mikes reading the description and into the Farpoint Media closer.